In real RAD style, we're building an image catalogue utility based on TAdvStringGrid in this example. Start the timer now, in about 5 minutes our image catalogue program will be ready. The new version 1.88 has support for 2 more image types per cell. These are TPicture and TFilePicture. TPicture opens up a whole array of image types that can be added to TAdvStringGrid. Standard, Delphi and C++Builder include support for Windows bitmap files, WMF and JPEG files. But thanks to the openess for other fileformats, it can be easily extended to virtually any graphic file format. The excellent GifImage unit of Anders Melander for example adds GIF file support. This is done by just adding the required unit to the uses list of your application. The first object that can be added to a cell is a normal TPicture object. Note that by creating a TPicture and loading an image, memory space is allocated for each image. Depending on the amount of pictures and size of each individual picture that must be added to the grid, this can put a heavy burden on memory load, but it will of course display fast. 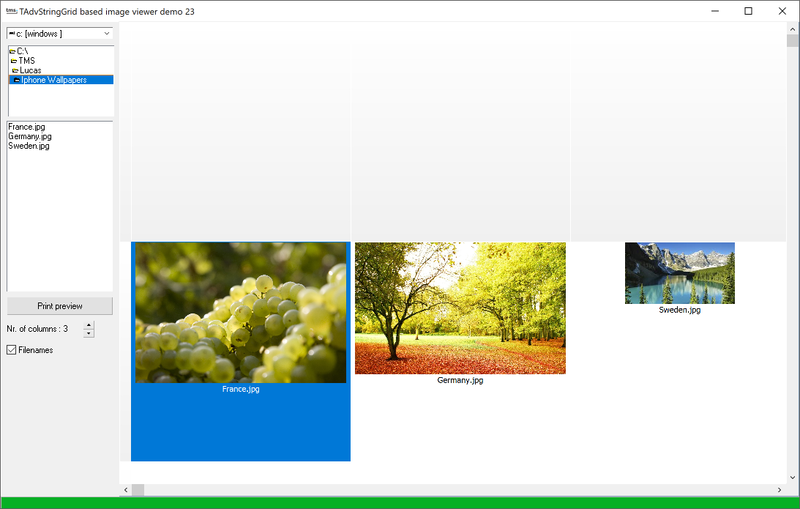 As an alternative, to allow a huge number of pictures in a grid, a TFilePicture is created. This object doesn't hold the picture in memory but loads it only when needed to update the display and therefore will be slower but will easily allow to add thousands of images to a grid. With v1.88, a new mechanism has been introduced to add pictures. In previous versions, it was necessary to create and free the graphic element in code outside the grid, giving the programmer the responsibility to maintain a list of created images and to free them at the appropriate time. With v1.88, a new methods have been introduced like CreatePicture, CreateBitmap, CreateIcon that create the graphic object for you and will automatically free it when the grid is destroyed or when the graphic element is removed from the cell. Therefore, in this image catalogue application, the Create method is used. In order to provide an easy directory browsing mechanism with Delphi & C++Builder standard controls, the DirectoryListBox and FileListBox controls are used to perform the searching for all .BMP, .WMF and .JPG files by setting the FileListBox filter property to *.bmp;*.wmf;*.jpg. Finally, there is a Padding parameter which allows to add some extra space around the image and the horizontal and vertical alignment. A TAdvPreviewDialog is dropped on the form and its grid property assigned to allow print preview and printing. Need more control for the print settings ? Drop a TAdvPrintSettings and button component on the form, assign the grid property and call the Execute method from the button click event. You can stop the timer now, as the image catalogue program is finished. Below 5 minutes ? Yes, sure, this is Delphi !